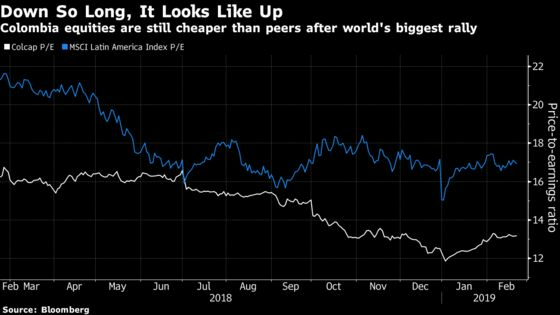 (Bloomberg) -- This year’s rally in Colombian equities has made them the world’s best performers, a rare moment for a market that has been handing investors losses for nearly a decade. The Colcap index is up 29 percent in dollar terms in 2019, the most among 94 primary indexes tracked by Bloomberg. Even after that rally, the Colombian benchmark is still down more than 20 percent from where it was at the start of 2010. Some stocks that were “excessively discounted” after a heavy sell-off last year have returned to “levels that are much more rational”, said Carlos Enrique Rodriguez, head of equity research at Bogota brokerage Ultraserfinco. The recovery has been led by Corporacion Financiera Colombiana S.A., which invests in construction and energy, and has returned 71 percent in dollar terms, and a 42 percent return in Grupo Aval Acciones y Valores, the nation’s biggest banking group, which rallied amid record profits. Both companies are owned by Luis Carlos Sarmiento Angulo, Colombia’s wealthiest man, whose fortune has risen by more than $2 billion so far this year. Last year, investigations into a scandal-hit highway project, including by the U.S. Department of Justice and Securities and Exchange Commission, helped send both stocks to the lowest since 2010. The investigations are continuing. Last year’s Colcap sell-off of 17 percent in dollar terms was aggravated by the exit of Harbor International Fund, the nation’s biggest foreign investor, which closed its positions in several Colombian stocks. This year’s rally may get more fuel from upcoming changes to pension-fund rules, under which more contributions from younger workers will be channeled into higher-risk funds. This will result in about $370 million per year of extra equities investment per year, according to a study by JPMorgan.